Oh! Here goes a Muslim trying to teach Christians about Christianity. I don’t see the wrong in doing so when I see Christians in the form of DAP politicians quoting the Quran teaching Muslims what ‘true Islam’ is. They even do so within mosques and suraus. 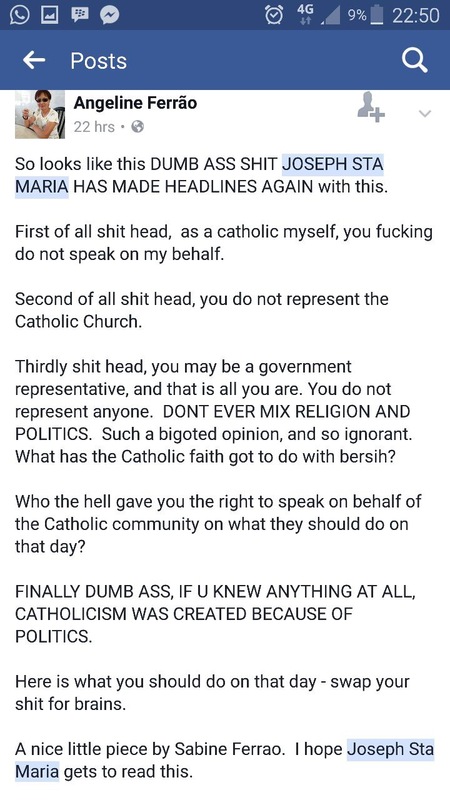 I find it amusing that some people think that Catholicism was borne out of politics. It wasn’t. Catholicism is the earliest form of Christianity that predates the First Council of Nicaea by 325 years! Followers of Jesus of Nazareth believes that Jesus is the son of God which is part if the Trinity concept. After Jesus was crucified and rose from the date, he appointed Peter as the leader, hence the very first Pope. Joseph Sta Maria is the head of the Melaka Portuguese Community and was appointed as a representative of minority ethnic communities under the state Barisan Nasional’s social service unit (Pembela), an effort by Malacca Chief Minister Idris Haron to address the needs, and include the views, of minority communities. 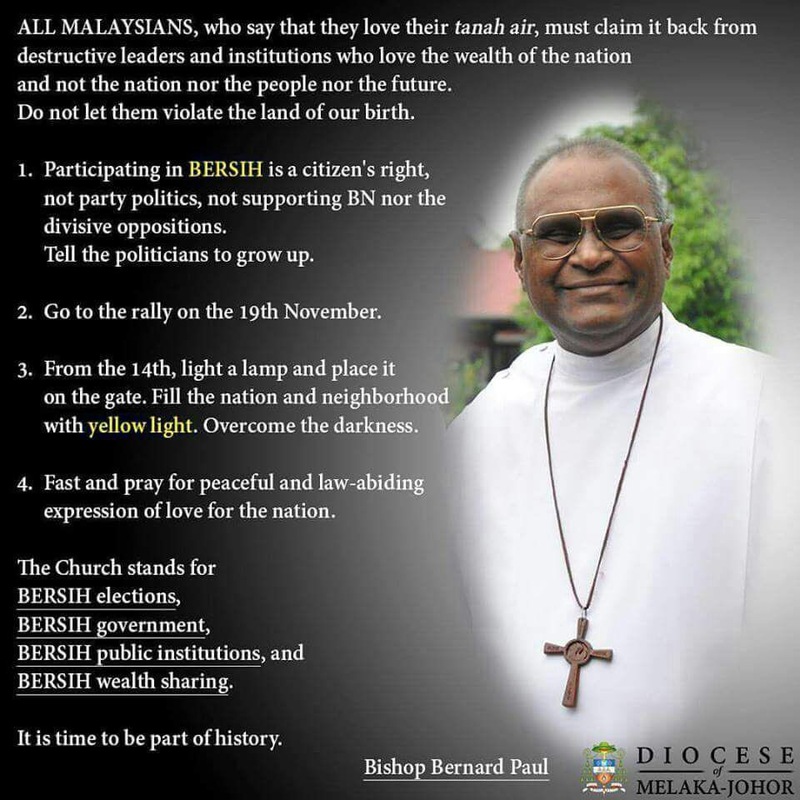 Mixing religion with politics started when Anthony Bernard Paul, the Bishop for Melaka and Johor, openly made a statement in support of BERSIH. The call by Bernard Paul for Christians to participate in the BERSIH rally invited the criticism by Parti Cinta Malaysia’s Vice President Huan Cheng Guan. As a Bishop, said Huan, Bernard should focus more on church matters rather than meddling into political matters that were irrelevant to religion. “A religious figure like him should not encourage the public to go for demonstration or rally. A highly respected religious figure, but he talks like an idiot,” blasted Huan. I personally find Bernard Paul’s calling as an invitation to anarchy. He gave his reasons for his support of BERSIH which goes along the thinking of Christian supporters if gun rights in the US and Christians might wrongly twist these into excuses for disrespect and disobedience to authorities which is forbidden by God as given in the Bible. The commandment is addressed to all mankind, without exception. Every person is included in this instruction—both believers and unbelievers. Every person is required to be in subjection to the governing authorities. Subjection certainly includes obedience, but it implies even more. Subjection focuses on the spirit or attitude of the individual, which leads to obedience. It recognizes an authority over us to which we are obliged to give not only our obedience but our respect. Whether democratic or autocratic, heathen or God-fearing, every government which has the power to rule over its people has been granted that power and authority by God. Therefore he who resists authority has opposed the ordinance of God; and they who have opposed will receive condemnation upon themselves. Of course there would still be thise Christians who would believe in Bernard Paul’s calling to the BERSIH rally more than God’s Bible. 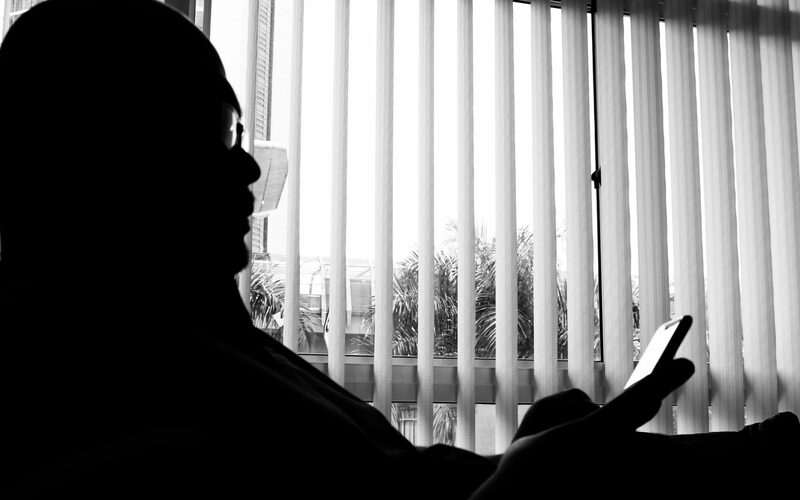 Given that Christians like Tony Pua, Hannah Yeoh and a few others who continue to lie despite calling themselves Christians, how many Christians actually believe in the Bible? And how many would remember 2Corinthians 11:14?